When we are on a healthy diet there is usually one thing that we keep making that doesn’t quite fit into our ideals of a healthy diet. My healthy diet includes attempting to make everything from scratch. I believe whole unprocessed foods are the most healthy and provide our bodies with everything we need so we don’t have to be so concerned about worrying ‘where is my protein’ or ‘am I getting enough calcium’ When you eat a varied whole foods diet, you will usually be getting everything your bodies needs. Plus if you make everything yourself from scratch you avoid all unhealthy additives, fillers, sweeteners, salt and unhealthy oils that are usually present in everything. So after completely changing my diet to now make everything from scratch including almond and coconut milk, almond butter, peanut butter, jam, oat flour, yoghurt, ice cream, date syrup, coconut butter just to name a few, I realised that I was clinging on to one processed food that I was consuming every day, and that was stock cubes. I have soup every day and always used to throw a few vegetable stock cubes in. 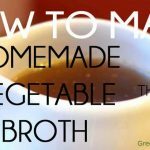 I had actually tried to make my own vegetable broth in the past and it didn’t turn out very well. So it’s enough to put me off trying to make it again. The method I had used works well for a lot of people but for some reason it didn’t taste good to me. I had saved a lot my vegetable scraps such as ends of celery, carrot peelings and tops of onions in a bag in the freezer and then boiled them up, and strained it, but I didn’t like the taste at all. Anyway, this time I used whole vegetables instead of scraps as I wanted to make sure it tasted good, and added some herbs and spices and the results was very good. There are so many recipes for vegetable broth and I’ve concluded you can pretty much include any vegetables you like but some of them are a bit strong and will overpower the flavour, so it’s better to stick with onions, celery, leeks, carrots and potatoes. This recipe produced a gorgeous vegetable broth. All you need to do is change the quantity to suit your recipe by adding more or less water. You can add more or less vegetables too, you can afford to be experimental with this recipe. It’s better not to let your vegetables go to waste just for the sake of sticking to a recipe exactly. You can store this in the fridge for up to a week and in the freezer for 3 months. It might be better to freeze this in individual cup portions if you are likely to need different quantities of stock for different recipes. Depending on how much stock you make, you will need a large stock pot for this. It makes more sense to me to make a big batch of this so you don’t have to make the stock quite as often. Add all the ingredients to a large pan or stock pot. Strain through a metal sieve. 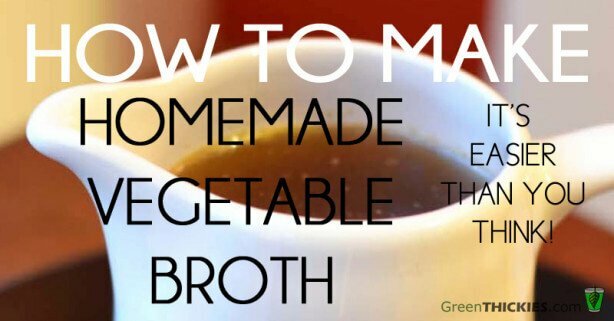 The liquid is your vegetable broth that you can use for soups and other recipes. You can compost the remaining vegetables.